Christie LCD flat panels and Christie Interactivity Kit are being used at the Cleveland Digital Public Library. The library wanted to promote its digital collection, which was limited to online viewing through the Digital Gallery, and realized it could highlight its collections on an interactive video wall and bring the material to life. 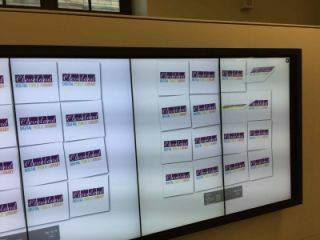 The multi-touch screen at the Cleveland Digital Public Library. The library chose Christie LCD panels, installed in a 4 by 1 design, to provide a 36 square foot digital canvas installed by AVI-SPL.